After purchasing our first two horses in 2002, we built an 8 stall barn never thinking it would ever be full. Each stall front is brick with the horse's name blocks mortared into place, to only be removed when they will be used as their markers. 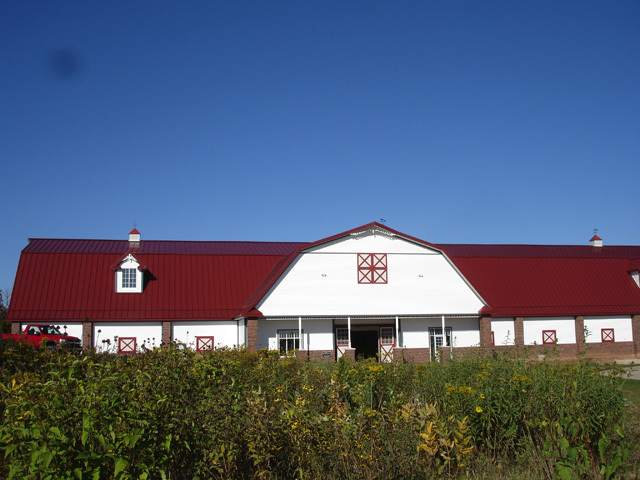 We also have our breeding lab and feed room located in the barn with a hayloft above. 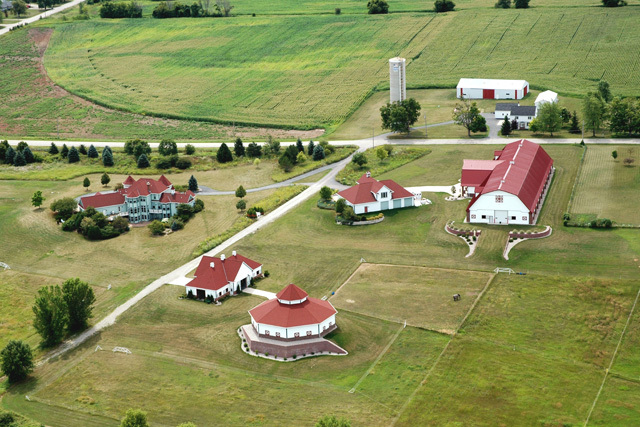 For the horse's grazing enjoyment, we have 25 acres put up in pastures. 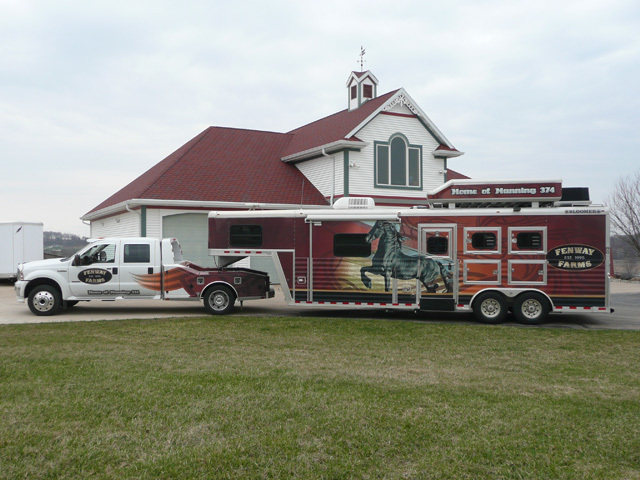 Winters in Wisconsin can last forever, so we built an indoor riding arena for a safe place to ride and so that the horses could be conditioned on a year round basis. 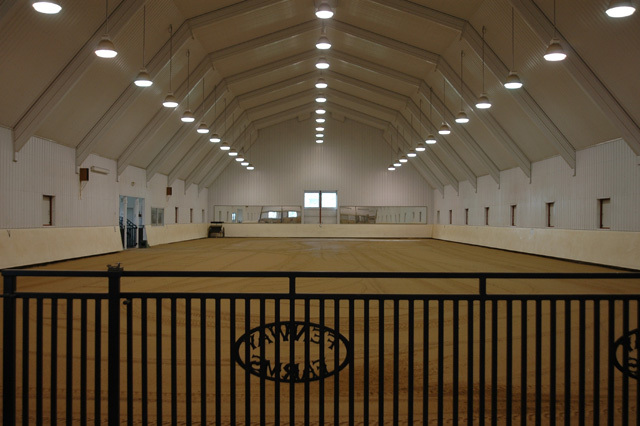 The arena contains a legal 66' x 200' dressage arena, tack room, restroom, lounge with a viewing area and four additional stalls on the end. 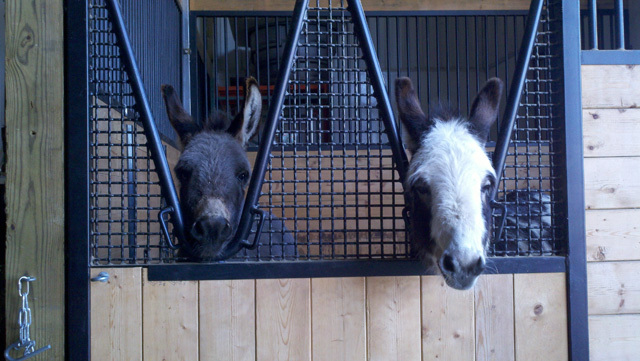 One stall has its own unique miniature donkey door with a low front and double yokes. The lounge serves as a wonderful start to any farm tour as it is home to our photo gallery and a great place to showcase farm awards and achievements. St. Francis stands outside the arena ever vigilant watching over the pastures and protecting all from harm. 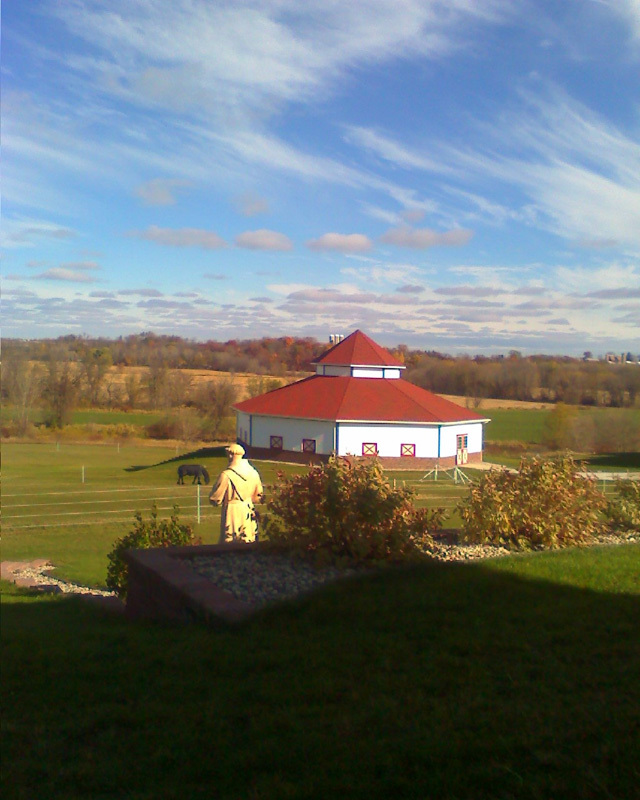 In 2008, we added an automated Belebro exercise mill, once again in its own building for year round use. 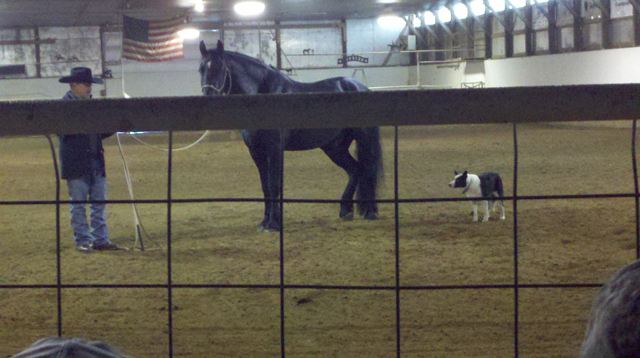 We can exercise up to 6 horses at one time with close to 100 different programs. With the unit mounted on the ceiling, the center initially housed a 65' round pen. 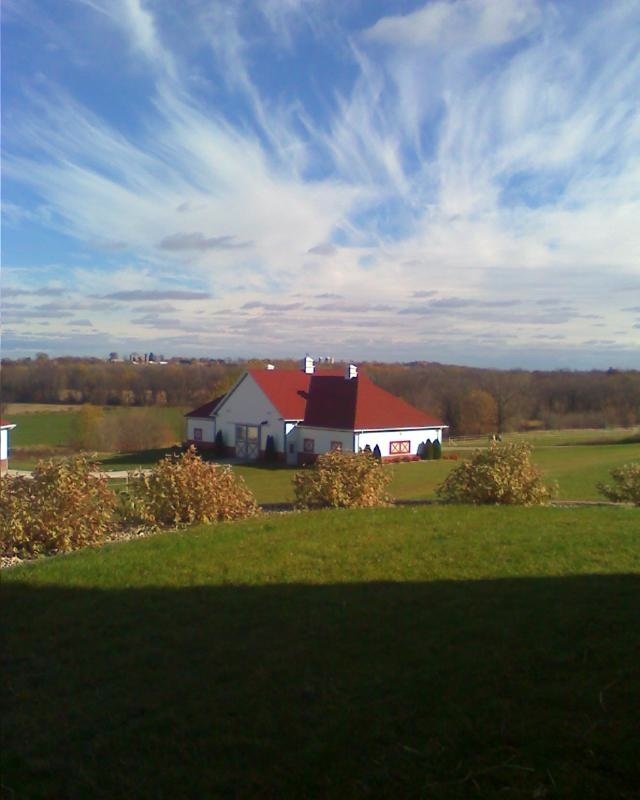 However, in 2009 that space was converted to our very own collection site for our stallions. The mill has been an invaluable tool in keeping all the horses in great shape. 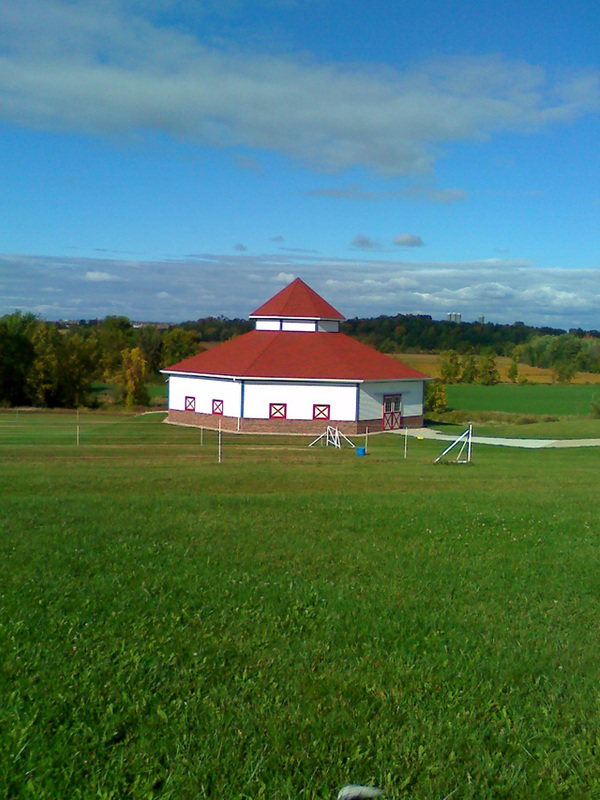 It should be noted that in the construction of all Fenway equine buildings the consideration of the well being of the horse was foremost in every design. Buildings were designed with the maximum cubic footage of air capacity. Multiple windows and doors were engineered to again, maximize cross ventilation, thereby encouraging substantial air exchange. Structures were also designed and constructed to eliminate any type of bird nesting within the building, virtually eliminating the potential introduction of aviary born diseases. We are proud that, in every step of the design process, the well being of the horse was first and foremost.